The ship was captained by one Mr. Charles J. Riches, and had only a single mate, a Mr. Webb, of London. Of the others on the list only a handful (possibly seven or eight) were white sailors: the rest were lascars of various grades. Who then were these lascars? The brief notations on the list reveal more than might be expected: although most of them were Muslims, there were some Christians and Hindus among them too. 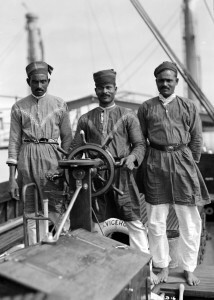 The oldest was a man of 48, from Sylhet, in what is now Bangladesh, and the youngest was a 16-year-old from Madras – but for the most part these men were in their twenties and thirties, by no means young, according to the standards of an age when English and American seamen commonly began their careers in their teens. The seniormost lascar was one Serang Mohammad, a thirty-two year old sailor from Bombay; next in seniority were the two tindals, of whom one was from Chittagong and the other from ‘Bamnell’, a place that has the distinction of being unknown to Google. For the rest, twelve of the lascars were from what might be called undivided Bengal – places such as Sylhet, Barisal, Noakhali, Calcutta and Howrah. 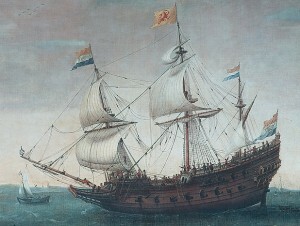 Another six were from various ports along the east coast of India, including Madras; one of the seacunnies, Roderick by name, was probably a burgher from Colombo; two others were from Goa; two were Malay; two were probably Arab-African; and another two were, in the vocabulary of the time, ‘Manila-men’, meaning Filipino. The crew of the William Stewart was by no means exceptional in its heterogeneity. The Tynemouth, a steamship of 1228 tons that sailed from Hong Kong to Australia in 1858, had a crew of 70, of whom thirty-six were white sailors, all English except for four Germans. The others were lascars of various grades, of whom seven were from Bengal. As for the rest they were from places too various to list severally: Daman, Cochin, Gorakhpur, Mungher, Bencoolen (off Sumatra), Massawah (in East Africa) and so on. In passing between languages the word appears to have taken on the connotation of ‘mercenary’ or ‘hired hand’ and was applied in this sense to a certain kind of sailor. The transition seems to have occurred first in Portuguese, in which the words laschar/lasquarim have been in circulation since about 1600 CE: as with many other nautical terms, it was probably through a Lusitanian route that it entered English[iii]. The nautical usage of the term is however, distinctively European: in the Indian subcontinent, for example, the word is still generally used to mean ‘army’ or ‘militia’. [iv] The extended meaning of ‘sailor’ would appear to have been introduced to the subcontinent by Europeans; when thus used today, it has a touch of both the exotic and the archaic. In sum, the word ‘lascar’ as used on the manifest of the William Stewart, belongs to two kinds of jargon, the nautical and the colonial, and its meaning is specific to those contexts. [ii] See for example: Albert Barrère, & Charles Leland: Dictionary of Slang , Jargon & Cant, Ballantyne Press, 1889, & Sir Henry Yule, & A.C.Burnell. : Hobson-Jobson: A Glossary Of Colloquial Anglo-Indian Words And Phrases, And Of Kindred Terms, Etymological, Historical, Geographical And Discursive, (new ed. edited by William Crooke, B.A. London: J. Murray, 1903). The Persian lashkar is often traced to the Arabic ‘askari meaning ‘soldier’ but this seems an unlikely link to me. The other possibility is that it is the Arabic ‘askar/’askari that derives from the Persian lashkar (such, indeed was the opinion of no less a philologist than the great Sir Henry Yule, of Hobson-Jobson). But this seems even more unlikely to me, for if this were so then there would have to be some accounting for fact that the Arabic word had, in the course of its travels, lost one consonant – ‘l’ – and acquired another, the guttural ‘ . There would have to be an accounting also for the plural of the Arabic word ‘askar/askari which is asâkir (while lashkar can be used as a collective). [iii] Cf. , The Oxford English Dictionary. [iv] Some subcontinental dictionaries do not even list the nautical meaning of the word. See for instance, Dr. Shaikh Ghulam Maqsud Hilali’s Perso-Arabic Elements in Bengali, (ed. Dr. Muhammad Enamul Haq), Central Board for Development of Bengali, Dhaka, 1967. Looking forward to reading more of it – so this was part of the research you did for writing sea of popies trilogy ..